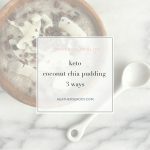 When I started eating keto I had rework some of my former favorite ‘lite' snacks to become keto friendly. This coconut chia pudding was born to be made keto friendly. I just swapped out lite coconut milk for full-fat coconut cream. I like Trader Joe's coconut cream in the can best because it doesn't separate. I also swapped out the maple syrup for Swerve. Since the coconut milk is naturally sweet, you only need to add a little Swerve and a dash of some ground cardamom or nutmeg; which are both best friends with the flavor of coconut, so experiment with your preferred amounts to your own taste. I really can't decide which is my favorite so try halving the recipe and make up a half-portion of each to try out. 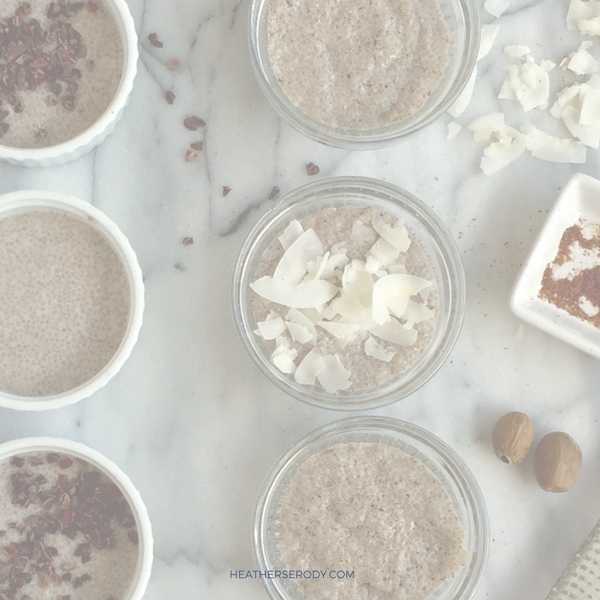 This chia pudding is an easy no-cook and totally satisfying fat bomb for those evenings when your sweet tooth strikes. Get yourself a big bag of white chia seeds to keep on hand because once you make this and see how easy it is, and how many delicious variations you can make you'll make it all the time. Whole Foods carries white chia seeds pre-bagged or you can order online. Of course, you can use black chia seeds, but I think the white looks so much better in this coconut milk pudding. 3. Raspberries, ‘ketoconut' whipped cream & Lily's keto-friendly chocolate chips. In a medium sized bowl, add coconut milk and Swerve and whisk until combined. Add chia seeds & spices of choice (nutmeg, cardamom, and/or cinnamon) and stir together well. Allow pudding to thicken for 10 minutes and stir again; breaking up any clumps until pudding is smooth. Allow pudding to thicken another 10 minutes, stirring occasionally. Pour pudding into individual ramekins or small mason jars & cover. Remove from fridge and allow pudding to warm slightly before eating - about 15 minutes. Add toppings of choice and a dusting of Swerve just before eating.